Nearest weather station, with distance and direction from RNA: The nearest weather station is at Norman, AR, seven miles from the RNA on an azimuth of 298°. The length of the record is 10 years. Annual precipitation (type, seasonal distribution): The average annual rainfall is 50 inches (1270 mm). Maximum and minimum temperatures: The temperature ranges from 100° F (82° C) to 0° F (–18° C). The average annual temperature is 65° F (18° C). Geology and Soils: Geologic formations in the RNA include: Polk Creek Shale, Bigfork Chert, Missouri Mountain Shale, Blaylock Sandstone and Arkansas Novaculite. Aquatic Features: Gap Creek runs through the RNA. 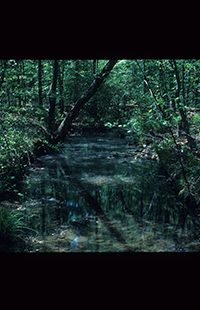 Plant Communities: The creek floodplain is forested with a mixed stand of hardwoods and pine. At Risk Species: The southern lady’s slipper (Cypripedium kentuckiense), a rare species, occurs in the RNA. Michigan lily (Lilium michiganense) has been collected there also. Common Shrub Species: The understory is rather sparse, and is composed of saplings of the same species as the overstory, as well as occasional individuals of American holly (Ilex opaca), paw paw (Asimina triloba), American hornbeam (Carpinus caroliniana), dogwood (Cornus florida), persimmon (Diospyros virginiana), and tree sparkleberry (Vaccineum arboretum). Common Herbaceous Species: The herbaceous layer is sparse on the slopes and only moderate on the floodplain. Herbaceous species include: Christmas fern (Polystichum acrostichoides), Jack–in–the–pulpit (Arisaema atrorubens), inland sea oats (Chasmanthium latifolium), dwarf wild iris (Iris cristata), spotted touch-me-not (Impatiens capensis), tall bellflower (Campanula Americana), starry campion (Silene stellate) and horse mint (monarda fistulosa). Common Mammal Species:The undisturbed forest and the available water provide excellent habitat for animal species, including white-tailed deer (Odocoileus virginiana) and raccoon (Procyon lotor). Common Bird Species: The broad-winged hawk (Buteo platypterus), the pileated woodpecker (Dryocopus pileatus), and the wild turkey (Meleagris gallopavo) have been observed on the RNA. Rettig, J. and K. Smith. 1982. Report on Gap Creek. Arkansas Natural Heritage Commission. Unpublished manuscript.